The last 2 days in the Alps set the race alight with a heated GC battle fought on the steep alpine slopes. The longer flat stages are a distant memory compared to the intensity the riders have faced in the high mountains. We have the pleasure to look at two stages of data, with incredible performances from Mikel Nieve on stage 11 (he was caught with only 300m to the line), along with Pierre Rolland’s ride on stage 12 to Alpe d’Huez. The analysis gives us a great snapshot into what it takes to perform in the high mountains at the biggest race in the world. On stage 11 Mikel Nieve was just 300m from winning his first Tour de France stage, only be caught by the flying Geraint Thomas. On this short 108km stage, two HC climbs, one C2 and one C1, this had already been an explosive day. Mikel took full advantage of the hard start, staying with the escape which went on the HC Montee de Bisanne. On this opening climb he produced many of his peak powers for the day, from 1min right to 60min. The riders took this first climb harder than the rest of the day, a trait we have seen across many mountain stages when the priority is to get into the early move and go for a stage victory. Nieve’s peak 20min power on this climb was 346w, 5.86w/kg, set on the hard middle section of the climb. The pace continued over the top as they began to open the gap on the others. It is easy to see from the table that Nieve did consistent efforts over each of the long climbs which greeted the riders on this short stage. His efforts kept him to the front of the leading break. It was onto the last climb of La Rosiere, with only 4 riders left an 9km to go, that Mikel made his move for the win. Mikel attacked his fellow escapees with a 20sec effort averaging 443w, 7.51w/kg. He maxed out at 607w, 10.23w/kg, which was enough to open a sizable gap on the others. This last climb was a case of trying to hold on to the lead, but it fell quickly with the massive effort from the GC contenders fighting to gain time on each other. During his final solo 8.5km Mikel really squeezed every bit of energy out of his system, bravely pushing himself to do 328w, 5.56w/kg for the final 23min of the stage—an extremely impressive effort after maintaining a normalized power of around 304w, 5.2w/kg for the 3hrs prior. Unfortunately, it was not to be a victory for Mikel, but the performance on the day can be seen as one of the best to date of this year’s Tour de France. 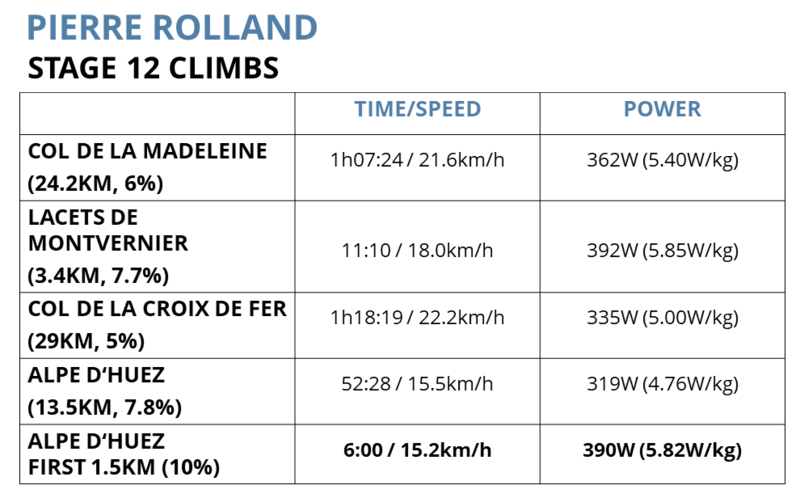 In stage 12 Pierre Rolland was a man on a mission. With team leader Rigoberto Uran out of the race, he was free to go on the offensive, and took full advantage. It was on Alpe d’Huez that Pierre Rolland had his famous victory in the 2011 TDF so the good memories would no doubt have been motivation for today’s stage. As we saw with Mikel Nieve the day before, the first climb of the day proved to be the one which set most Pierre’s peak powers for the stage. With a large breakaway going prior to the start of the long 25km Col de Madeleine, Pierre was clearly determined to be part of the early move as he jumped across to the break on the lower slopes of this climb. Once he was with the 25-strong breakaway, he immediately sensed that the group was too large to succeed, and proceeded to make the pace high enough to split the group. It was at this point that he did his peak 1min power for the day, attacking ambitiously with 20km to go to the top of the Madeleine. 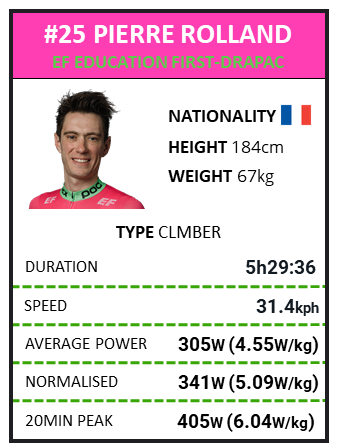 Pierre produced 514w, 7.17w/kg for the attack and proceeded to keep the pace hard enough that only a select 7 other riders were able to join him at the top of the climb. This strategy to reduce the group helped Pierre produce all his peak powers from 1min to 1hr on this climb. 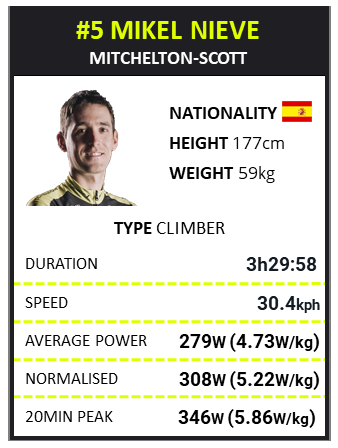 His peak 20min power was done right at the bottom of the climb, consisting of 405w, 5.6w/kg. 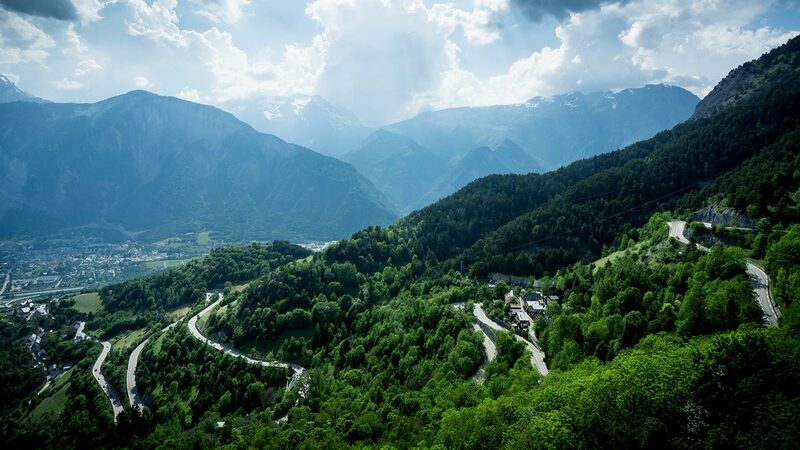 Despite Pierre’s efforts, a regroup of that leading break was made on the descent and in the leadup to the cat 2 Lacets de Montvernier, with its stunning backdrop and twisting roads. It was on the lower slopes of this 3.4km climb that Pierre again went on the offensive to reduce the break. On this climb he produced 392w, 5.85w/kg for 11min as he soloed over the top of the climb. This time he was successful in reducing the number in the leading break to 11 riders, allowing them to hit the bottom of the Croix de Fer with everyone committed to making it to the Alpe in the lead. It was on this climb that Dutch GC hopeful Steven Kruijswijk (LottoNL-Jumbo) took off in hopes of a solo victory. With still some 70km to go, this was a daring move, and one which Pierre resisted joining. Instead, he kept to the fore of the original breakaway, which was reduced to only 4 riders by the top of the Croix de Fer. The leading group kept pushing ahead with the Team Sky train breathing down their necks. it was looking likely that the GC group would swallow them up in the valley road leading to the foot of Alpe d’Huez, and they were indeed caught with only 5km before the foot of the final climb. The greatly reduced GC group then drove exceedingly hard to catch the solo Steven Kruijswijk. The opening 1.5km of the Alpe, Pierre was still riding in contention with the main GC riders. 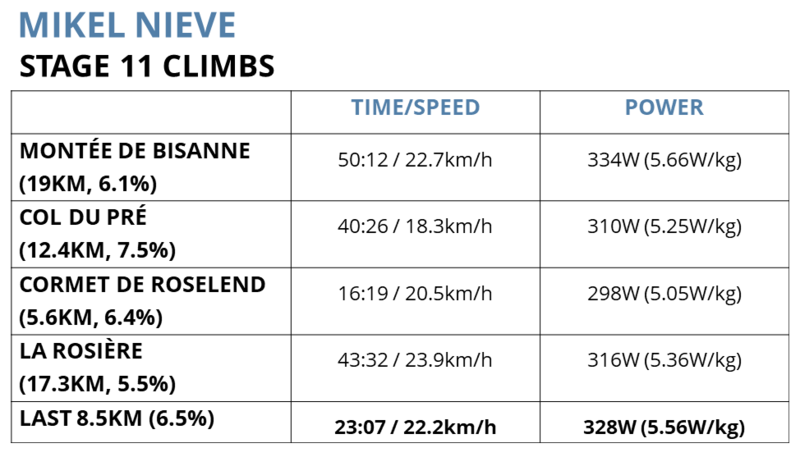 In this opening 6min of the climb Pierre did 390w, 5.82w/kg trying to keep in touch with the Team Sky-led group. Unfortunately this pace was too much for Pierre after his earlier efforts. He completed the total climb in 52:28min, doing 319w, 4.76w.kg. In the end though, he only lost 10min to the stage winner Geraint Thomas. On the back of 3 incredible hard and hot 3 days in the Alps, Pierre’s ride is a fantastic indication to his fitness. A stage win later in the race seems a real possibility after his exploits in the Alps.